McCabe Fence has proudly provided security, privacy, and beauty to Falmouth area homes for more than 25 years. We are a full service fencing company, offering top quality workmanship, brand-name products, and low, competitive rates. 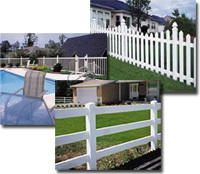 As the exclusive Heritage Vinyl Products dealer in our area, we specialize in maintenace-free vinyl fencing. We don't just do new installations, so if you have an existing fence that needs anything from a little fix up or major repairs to re-staining or painting, we can help take care of it. For more information, please visit our products and services sections. For All Your Fencing Needs - Call Today!